Otgontenger Uul trek was designed and tested by Eshar. a. Otgontenger Uul (Youngest Sky mountain, elevation 4008 m') - the highest peak in the Khangai Mountains in Mongolia and the third highest in the country. The mountain is located in Zavkhan Province and it is the only peak in the Khangai mountain range that is capped with a permanent glacier. The south face of Mount Otgontenger is the most extensive granite wall in Mongolia. 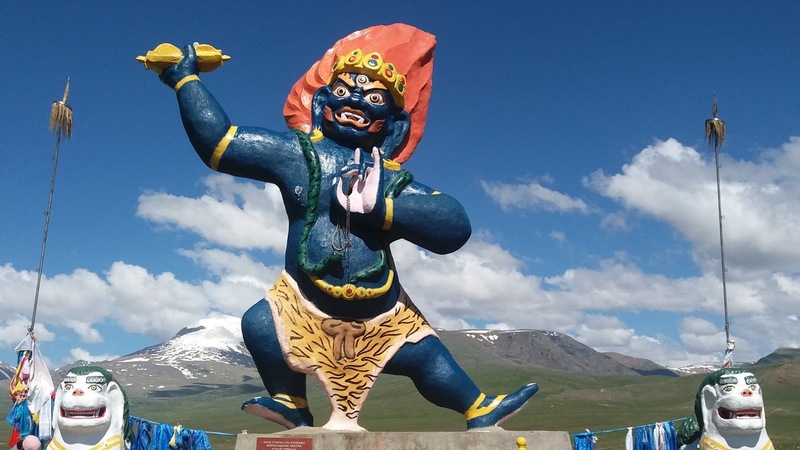 traditional Mongolian beliefs have held that wrathful deities inhabit many of Mongolia's sacred mountains. Ochirvaani is particularly associated with Otgontenger. b. Tsagaan Nuur (white lake) - fresh water lake along the trek's first walking day. c. Khokh Nuur - anither, bigger fresh water lake. located closer to Otgontenger. d. Dayan davaa (pass) - a very sacred mountain pass to the mongolians. features a lot of ovoo's and a great view of Otgontenger. Public Transportation - there are public vans from Uliastai to Otgontenger settlement. not daily and leaves when full. Social Transportation - you can hitchhike from Uliastai to the junction of Bayan children's camp pinned on the map). can take ome time, but there are vehicles going by. Private Car\Hired Driver - there is a route from Uliastai (pinned on the map) to Bayan children's camp and the starting point. Horse - follow the car road to Bayan children's camp. takes about 2 days. easy. there is a car dirt road that goes from the starting point, via Tsagaan Nuur east bank to Dayan Davaa. from the pass you can see Khokh nuur, and after that you follow the creek that goes from khokh nuur to the north until you hit Bayan children's camp or Bogdin gol (river). four days by foot, three by horse (aprox. six if you start in Uliastai). Tsagaan Nuur - clean water. good to drink, boiling is enough. cost:a. guide - there's no need. not sure you can find one. b. jeep\van - a van from Uliastai is about 10,000\person. jeep from Uliastai is around 90,000 each direction (depends which type of jeep). c. ger camps - there are ger camps on the road to otgon tenger and on Tsagaan Nuur's west bank. only if someone invites you in. there's a doctor and an emergency room in Uliastai. Once every five years there is an official ceremony worshiping this beautiful snow caped mountain. In year 2016 it will take place on the early morning of July 22nd. The president of Mongolia is expected to take part in the ceremony and present his offerings to the mountain. Find transportation to the ceremony site from Uliastai, the capital of Zavkhan Aimag. Ask for advice at Chigistei Restaurant, there should be some one speaking English. Show them this news page announcing the 2016 event. the other two are Burkhan Khaldun and Bogd Khan Uul overlooking Ulaanbaatar from the south. long before Buddhism became advent in Mongolia. The mountain resembles the religious figure named Ochirvani (Vajrapani). Vajrapani is one of the three protectors of Buddha and the Family protector. shows after minute 3, short video clips from the previous ceremony.